Ask us about our no upfront cost Area Developer Opportunity. InkCredibles has the most attractive Area Development Program in the industry. With InkCredibles you will have the opportunity to be an Area Developer at NO ADDITIONAL UPFRONT FEE'S. We are currently seeking aggressive partners with our National Expansion plans. Contact Dennis Butlett for more details. It's simple: there is money to be made in the cartridge refill industry. Plus, with a unique business plan that outlines four distinct sales sources, InkCredibles is ready capitalize on the increase in demand. Retail Storefronts market to the general public and cater to walk-in traffic. Wholesale/B2B Sales teams develop relationships with area businesses that facilitate routine orders, and hassle-free pick up and delivery. E-market An owner's online marketplace enables customers to place their orders from the convenience of their own homes. Community Groups/ Fundraising Assists local non-profit organizations in fundraising with "cartridge drives," while simultaneously broadening profitability and brand awareness. InkCredibles has a marketing program specifically tailored to these four markets. InkCredibles also has opportunities for area developers. As an area developer, you own an exclusive territory which allows you to receive a share of new stores sold in your territory. This opportunity is for those that want an expanded role and larger income potential with our brand. Looking for an Ink Cartridge Franchise? Upfront cost program. Request More Information today!!! InkCredibles is a printer cartridge refill center and business resource, poised to become indispensable to the American office. 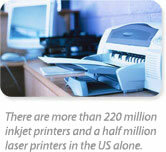 There are more than 220 million printers used in homes and businesses in the US. Cartridge refills offer consumer savings of up to 50%. Environmental regulations continue to push recycle and reuse initiatives in all facets of modern life. InkCredibles has the best methods for refilling HP, Lexmark, Canon and Dell inkjet cartridges. Your store will also provide inkjet cartridges for all other inkjet, photo and toner-based printers. If you choose, we can train you to refill toner cartridges or you may choose to participate with our partners in business to sell remanufactured toner cartridges or a combination of both.